Safety is our biggest priority and we pride ourselves in having the highest standards when it comes to sterilization and hygiene. The standards applied in our clinics exceed the legal requirements of Switzerland and France and we apply them to every aspect of our practice, from small tools to materials and equipment such as gloves, masks and needles. We carefully and thoroughly clean all the instruments using ultrasound and manually inspect each instrument before sterilisation. At Helvetic Dental Clinics, for our premises cleaning and disinfecting procedures, we adhere to the Safety and Asepsis Procedures (OSAP http://www.osap.org/) standards. 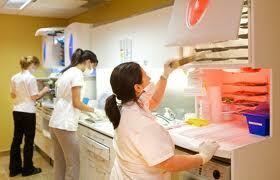 You can rest assured that we go above and beyond the basic expected standards of hygiene in our dental clinics. Melag is the one of the most prominent manufacturers in the field of hygiene and instrument treatment whose main focus has always been focused on quality and reliability. The instruments are produced in Berlin, Germany. Melag is the world’s largest company specialized in manufacturing sterilizers and washer-disinfectors. Vacuklav 30B+’s salient efficiency ensures the short operating time in order to have more time for the patients. The automatic cycles can be started with a single Start/Stop key where the complete sterilization, as well as the drying process take place. This device is considered to be one of the fastest sterilizing machines on the market. The run cycles take 15 minutes, altogether with the vacuum-drying. 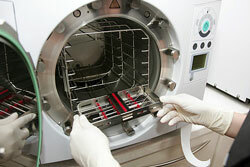 Approximately 30 minutes later after a cycle, a new sterilizing process can be started, depending on the total load of the autoclave. Vacuklav 30B+ machines are connected to tap water which generates the steam; another part of the tap water is used to cool the vacuum pump. This high performance feature ensures faster program runs. For your safety and your comfort, Helvetic Clinics Hungary has pushed the hygiene standards far beyond the regulatory standards!